Phase 5 developments – a name that many people haven’t heard of before. German in origin, this company produces little things to bring your Amiga up to the cutting edge of personal workstations. I must admit to being not uninterested when the chance came to get my hands on their offerings; I may have jumped at the chance, but only a little bit. Gordon Harwoods have taken on their products in the UK. Hot from Germany they now have the CyberStorm accelerator and the CyberVision 64 graphics card. Just to let you know where you stand before we actually look at the stuff, be aware that the graphics card needs a Zorro III slot as found in the 3000 or 4000 (and some expansion cases for the 1200) and that the accelerator needs a CPU slot as found in the 3000 or 4000. First off, the accelerator. The CyberStorm is a modular system as you can see from the photograph – everything plugs into a main control board offering the chance of easy upgrading as more becomes available. 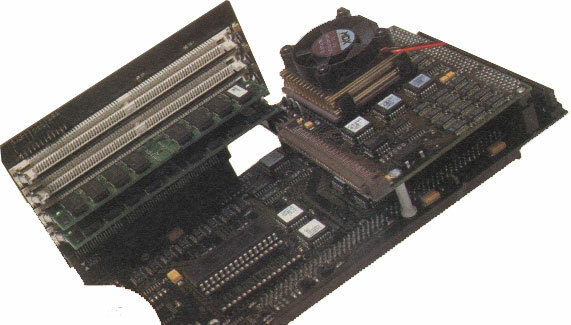 The design of the board really requires it to be fitted into a 4000, but the hardware will alledgedly work in a 3000 if the machine was re-cased. All that I can say for definite is that it will not work in a 3000 with revision 7 buster chip – however, successful use has been reported when using a revision 11 buster chip. Check with your dealer before buying! If that fails, Harwoods can check with Germany for you. The review model was fitted with a 50MHz 68060 chip, which is the latest (and possibly last) chip in the Motorola 68000 family. The technical specification of this chip is scary: 2.5 million transistors, dual superscalar execution (meaning that two integer instructions are carried out simultaneuosly), branch cacheing, instruction and data cacheing, deep pipelines and much more. If this means nothing to you, rest assured that these techniques are employed to make the thing take as few cycles to execute an instruction as is possible – in fact it is possible to get more than one instruction executed for every clock cycle which explains why the 66MHz version claims to offer over 100MIPS for certain instructions.